If you get a stomach ache after eating your morning bowl of oatmeal or an oatmeal cookie, determining the specific cause may not be as easy as you think. While your immediate reaction may be to blame the oats, it’s possible that ingredients added to the oats or substances that contaminated the oats during growing or processing may actually be the cause of your stomach woes. Approximately 2 percent of American adults have food allergies, according to Beaumont Laboratories. 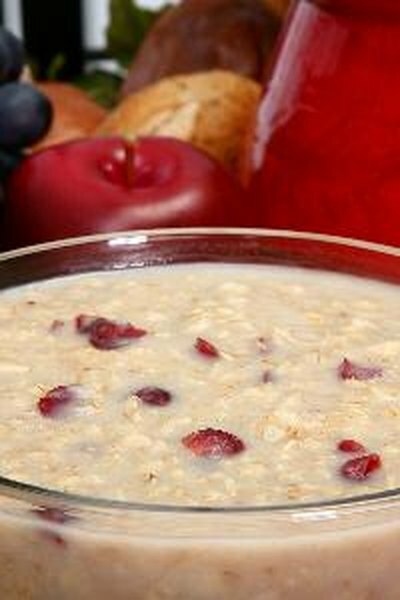 While it's possible to have an allergy to oats, oat allergy is uncommon. If you have a wheat allergy, you may have symptoms eating oat products, since oat and wheat fields are near each other during the growing season. Oat and wheat products are often processed in the same manufacturing facilities, as well. Allergy symptoms include stomach discomfort, diarrhea, vomiting and possibly rash, hives, facial swelling, difficulty breathing, weakness or dizziness. Symptoms usually occur within 45 minutes after ingestion. If your symptoms include facial or throat swelling and difficulty breathing, you need emergency medical help immediately. See your doctor for allergy testing if you think you might be allergic to oats. If you have celiac disease, a disorder caused by an inability to eat foods containing gluten, you may have reactions to oat products as well. While oats do not contain gluten, they can be contaminated with wheat, which contains gluten. Symptoms of celiac disease include nausea, diarrhea, gas, bloating, abdominal pain, vomiting and greasy, foul-smelling stools that float. If you add milk to your oatmeal, your stomach problems may be due to lactose intolerance. According to the Ohio State University Medical Center, between 30 and 50 million Americans have lactose intolerance, a condition in which they can’t break down lactose, the sugar found in milk, because they lack the enzyme lactase. Lactose intolerance can develop at any time in life and becomes more frequent as people age, so it’s possible that you may be developing it. If you’ve had recent intestinal surgery or a stomach virus, you may develop temporary lactose intolerance because of damage to the villi in the intestines that produce lactase. Symptoms of lactose intolerance include gas, diarrhea, bloating and stomach discomfort within 30 minutes to a few hours after consumption of lactose. Additives in your oatmeal may be causing your indigestion. While you can buy oatmeal cereal that consists simply of oats, many commercial oatmeal products contain added sugars, artificial coloring and bits of fruits that could cause stomach problems. Allergy testing can determine what you’re allergic to so you can avoid the substances in other foods.